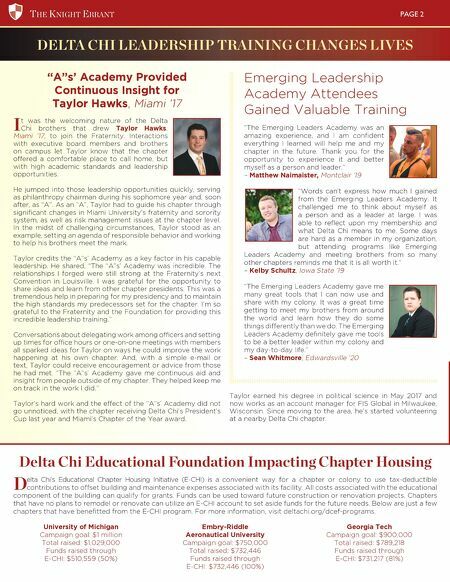 The KnighT erranT PAGE 2 "A"s' Academy Provided Continuous Insight for Taylor Hawks, Miami '17 I t was the welcoming nature of the Delta Chi brothers that drew Taylor Hawks, Miami '17, to join the Fraternity. Interactions with executive board members and brothers on campus let Taylor know that the chapter offered a comfortable place to call home, but with high academic standards and leadership opportunities. He jumped into those leadership opportunities quickly, serving as philanthropy chairman during his sophomore year and, soon after, as "A". As an "A", Taylor had to guide his chapter through significant changes in Miami University's fraternity and sorority system, as well as risk management issues at the chapter level. In the midst of challenging circumstances, Taylor stood as an example, setting an agenda of responsible behavior and working to help his brothers meet the mark. Taylor credits the "A"s' Academy as a key factor in his capable leadership. He shared, "The "A"s' Academy was incredible. The relationships I forged were still strong at the Fraternity's next Convention in Louisville. I was grateful for the opportunity to share ideas and learn from other chapter presidents. This was a tremendous help in preparing for my presidency and to maintain the high standards my predecessors set for the chapter. I'm so grateful to the Fraternity and the Foundation for providing this incredible leadership training." Conversations about delegating work among officers and setting up times for office hours or one-on-one meetings with members all sparked ideas for Taylor on ways he could improve the work happening at his own chapter. And, with a simple e-mail or text, Taylor could receive encouragement or advice from those he had met. "The "A"s' Academy gave me continuous aid and insight from people outside of my chapter. They helped keep me on track in the work I did." Taylor's hard work and the effect of the "A"s' Academy did not go unnoticed, with the chapter receiving Delta Chi's President's Cup last year and Miami's Chapter of the Year award. DELTA CHI LEADERSHIP TRAINING CHANGES LIVES Delta Chi Educational Foundation Impacting Chapter Housing D elta Chi's Educational Chapter Housing Initiative (E-CHI) is a convenient way for a chapter or colony to use tax-deductible contributions to offset building and maintenance expenses associated with its facility. All costs associated with the educational component of the building can qualify for grants. Funds can be used toward future construction or renovation projects. Chapters that have no plans to remodel or renovate can utilize an E-CHI account to set aside funds for the future needs. Below are just a few chapters that have benefitted from the E-CHI program. For more information, visit deltachi.org/dcef-programs. University of Michigan Campaign goal: $1 million Total raised: $1,029,000 Funds raised through E-CHI: $510,559 (50%) Embry-Riddle Aeronautical University Campaign goal: $750,000 Total raised: $732,446 Funds raised through E-CHI: $732,446 (100%) Georgia Tech Campaign goal: $900,000 Total raised: $789,218 Funds raised through E-CHI: $731,217 (81%) Emerging Leadership Academy Attendees Gained Valuable Training "The Emerging Leaders Academy was an amazing experience, and I am confident everything I learned will help me and my chapter in the future. Thank you for the opportunity to experience it and better myself as a person and leader." – Matthew Naimaister, Montclair '19 "Words can't express how much I gained from the Emerging Leaders Academy. It challenged me to think about myself as a person and as a leader at large. I was able to reflect upon my membership and what Delta Chi means to me. Some days are hard as a member in my organization, but attending programs like Emerging Leaders Academy and meeting brothers from so many other chapters reminds me that it is all worth it." – Kelby Schultz, Iowa State '19 "The Emerging Leaders Academy gave me many great tools that I can now use and share with my colony. It was a great time getting to meet my brothers from around the world and learn how they do some things differently than we do. The Emerging Leaders Academy definitely gave me tools to be a better leader within my colony and my day-to-day life." – Sean Whitmore, Edwardsville '20 Taylor earned his degree in political science in May 2017 and now works as an account manager for FIS Global in Milwaukee, Wisconsin. Since moving to the area, he's started volunteering at a nearby Delta Chi chapter.